This 1908 clipping from the Wellington newspaper the Evening Post reports two decisions by the Arbitration Court. A firm of tailors and a carpenter were fined for breaking the laws on apprenticeship. 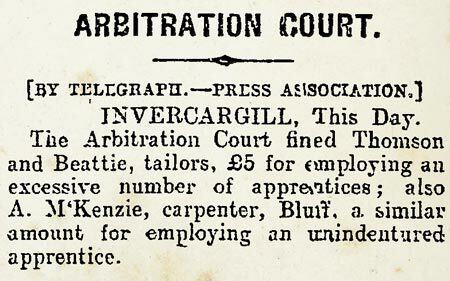 The tailors were fined for employing too high a ratio of apprentices to qualified tradespeople, and the carpenter for employing an apprentice who was not properly registered for training.